American COE designs began to appear as a way to maximize loads to abide within individual U.S. state regulations. By shortening the overall length of the truck cab the trailer size could be increased while staying within the overall length limit dictated by each state. COE trucks would help play a vital role in America's industrial growth over the ensuing decades. All the major truck manufacturers are featured along with the many models offered throughout the decades into the 1970s, as well as a brief look at the COE models offered through the 1980s to today. As well as historical data and specifications, all the innovative concepts and features developed as COE designs evolved are highlighted, as well as the numerous ideas that were tried, but proved to be only temporary solutions. 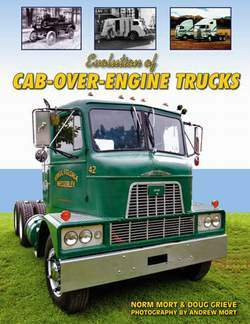 Enjoy this lavishly illustrated, informative evolution of COE trucks, the first history ever published focusing on the history of COE trucks in America.